Do you need a lift? Having our own crane truck provides you with the reassurance that you will not be let down! Overhead door and loading dock systems are made up of heavy mechanical parts. There is no need for your employees to be working one of your forklifts while we do work on your loading dock or door equipment. It is not fair to put them in an unfamiliar situation trying to help another trade (which is a common occurrence in the door service industry). 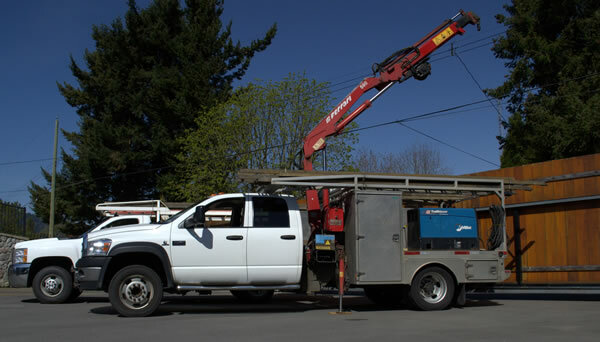 Our technicians are trained in the use of our crane truck and practice safe, efficient operation around your business and employees at all times. Having our own crane truck makes us more efficient so we can quickly address your complex door or loading dock issues without having to call in additional services. DoorTech Industries is also equipped with 24′ and 20′ Flat deck trailer for all types of equipment relocation projects as well. Need to move a loading dock system to another warehouse? DoorTech Industries has got you covered.